I grew up just outside New York City and when my wife and I decided to take Evy up to see the family for Christmas, we thought it would be a great opportunity to spend a night in the city. We’ve had incredible experiences with the Andaz chain, including a fantastic stay at Andaz Wall Street back in 2014, so we decided to check out the Andaz 5th Avenue this time around. Though we only stayed one night, it once again affirmed our love of the brand. The property is situated on the corner of 5th Avenue and East 41st Street, directly across the street from the New York Public Library. 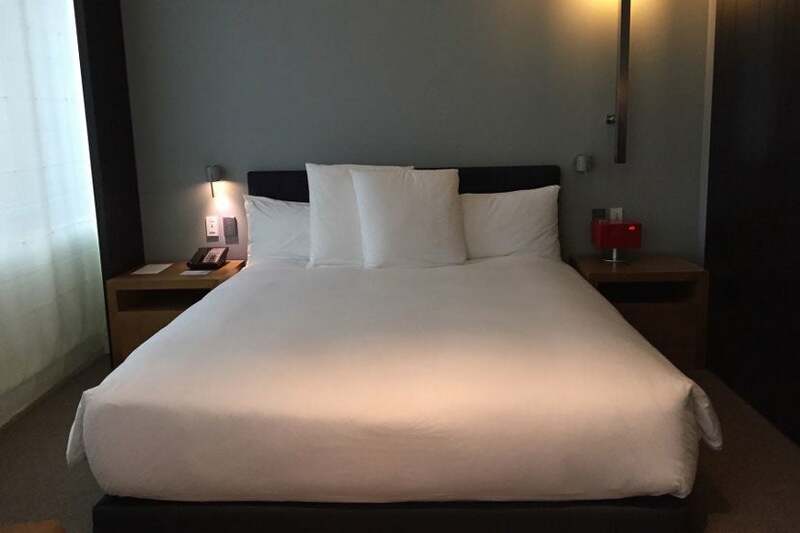 If you are traveling to Manhattan to see big tourist sites like the Empire State Building, Times Square and Rockefeller Center, among others, this hotel is in the perfect location. It’s a short stroll to many popular spots but also in a quieter section of Midtown, giving guests a fantastic combination of convenience and calm in the city that never sleeps. When we first planned our trip, revenue rates were well over $400 per night, so I transferred some Chase Ultimate Rewards points I’d earned from using my Chase Sapphire Preferred Card to my Hyatt Gold Passport account and reserved a standard Andaz king room for 25,000 Hyatt Gold Passport points. I kept my eye on room rates leading up to the stay and a couple of months before our arrival, I noticed AAA revenue rates had dropped to $270 per night. Since that dropped my redemption value down to approximately 1.25 cents apiece (well below TPG’s most recent valuation of Hyatt Gold Passport points), I decided to rebook and apply a Diamond Suite Upgrade to the reservation. This actually bumped us into a 787 square foot Andaz Splash Suite instead of the standard 400-600 square foot Andaz Suite, a terrific way to maximize these certificates. 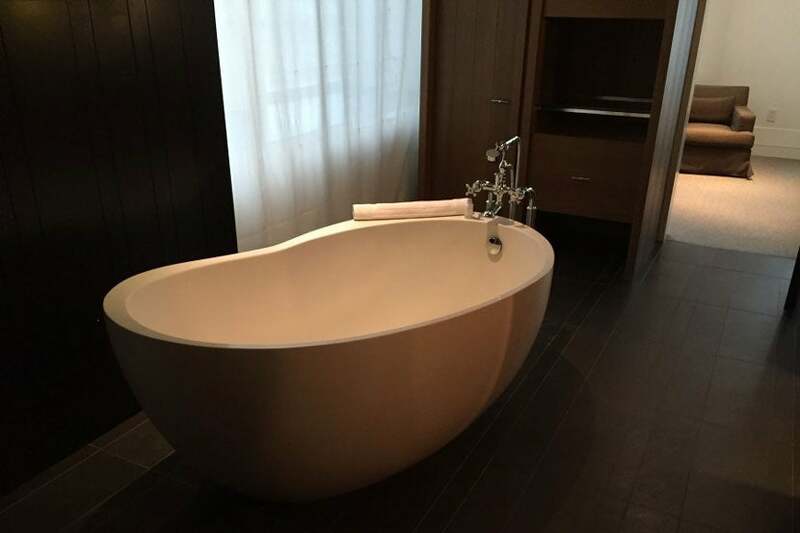 A Diamond Suite Upgrade will push you into the Splash Suite at the Andaz 5th Avenue. It’s also worth noting that the rate dropped yet again about a month before our stay and when I called Hyatt Gold Passport, they adjusted the rate over the phone and kept my confirmed suite upgrade. Our final rate was $225 per night, though booking directly into the Splash Suite would’ve set us back $525 for the night. We landed in New York-LaGuardia (LGA) around 12:30pm and hopped in an Uber to Manhattan, taking advantage of Uber Car Seat so as not to lug Evy’s car seat on the plane and around the city with us. The rainy weather caused some traffic delays, but the ride was only about 35 minutes and we were dropped off near the 41st Street entrance. While the boutique nature of most Andaz properties doesn’t equate to ornately decorated lobbies, I felt like this one was particularly sparse with low ceilings and minimalist decor. The lobby of the Andaz 5th Avenue. We had a short wait to be helped but once it was our turn, the friendly front desk agent quickly processed our check-in, recognizing my Diamond status and reminding me of the Diamond amenities. She had to call housekeeping to see if our room was available so early, but just a few seconds later she happily confirmed that it was. We were assigned Room 405, which like all Andaz Splash Suites was nestled into the corner of the building and provided floor-to-ceiling windows overlooking both 41st Street and 5th Avenue. The door opened into a small entryway with a pre-placed luggage rack and a wood-and-glass shelving unit that housed the mini bar. Entering our room at the Andaz 5th Avenue. 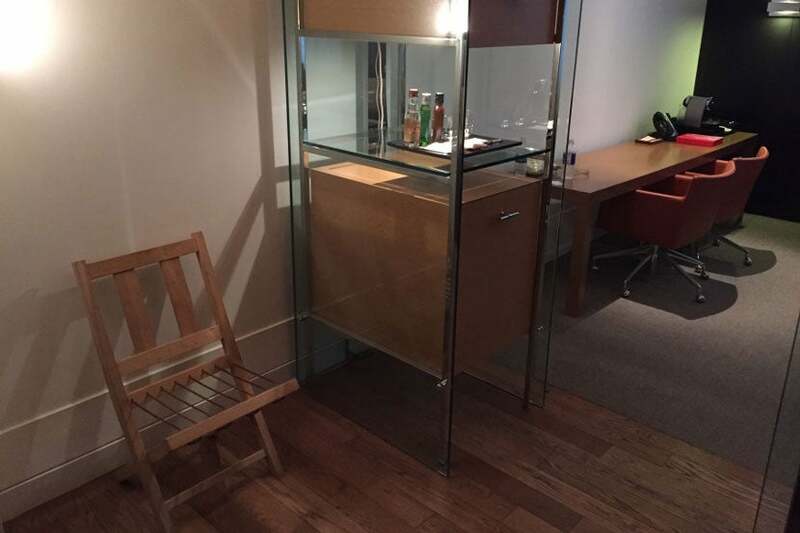 Just beyond that was a simple desk built into the wall on which sat the Nespresso machine, a room service menu and a dark wooden crib had been preset by the window. I have found that Hyatt properties, in general, do a great job of welcoming us whenever we’re traveling with Evy. 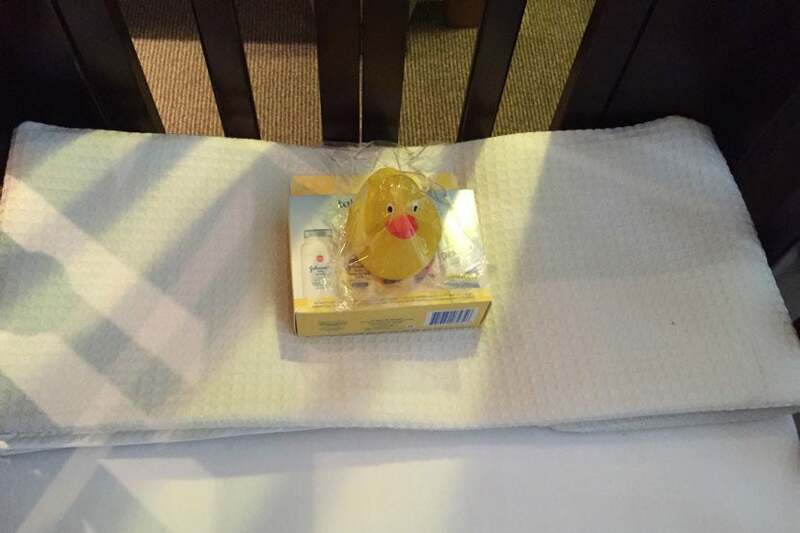 While the amenities here didn’t compare to those of the Park Hyatt Zurich, we did find a set of bath amenities, a blanket and a cute little yellow rubber ducky ready for our use. This cute little guy was waiting for us in the crib. After walking through the short entryway, the room opened up to the right with a comfortable but sparsely decorated living room — the high ceilings easily compensated for the relatively narrow, rectangular shape of the room. A newly mobile Evy, pictured below, quickly started exploring the amenities. 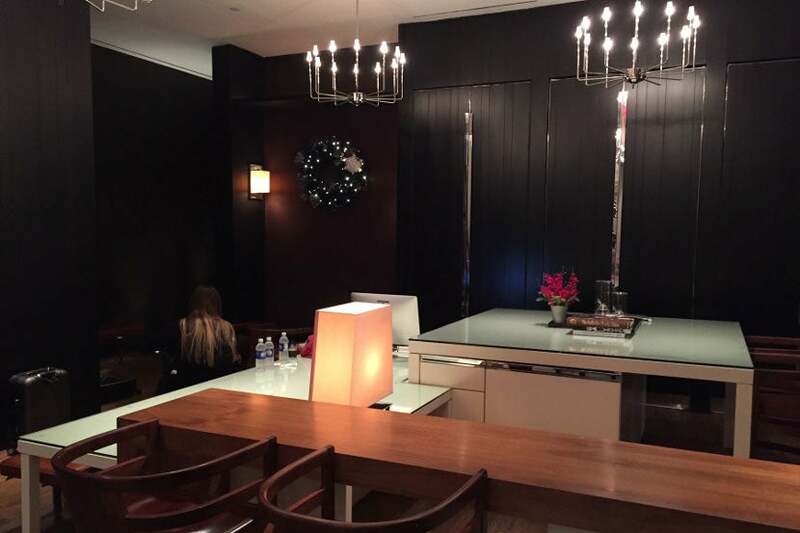 Evy had a great time checking out the living room area. Just through the living room was the bathroom, which was laid out in a very interesting configuration. There was actually a sort of hallway running through the middle of the room, effectively linking the living room to the bedroom. The floor and most of the walls were done in a dark marble, though the brown wood of the armoires helped warm the decor significantly. The bulk of the floor space was taken up by a large white soaking tub, located just to the left of the walkway. The luxurious bathtub in our room. 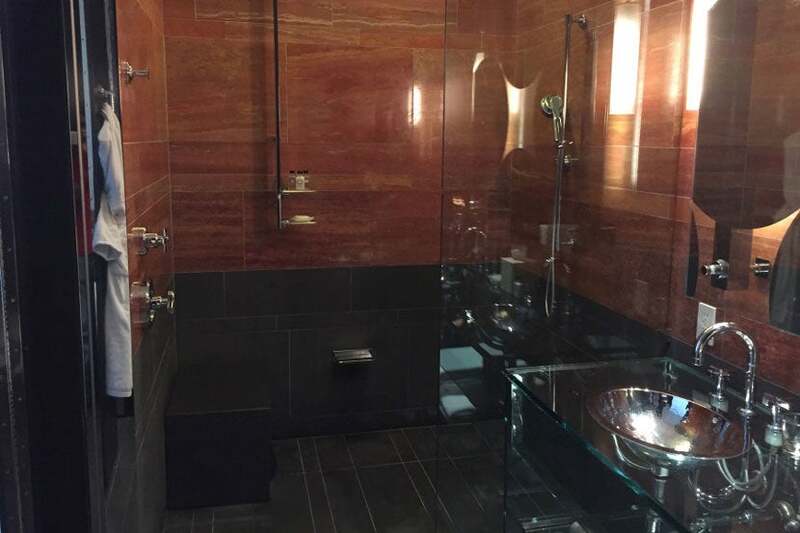 To the right was the rest of the bathroom, including the shower, double sinks and toilet. A look at the rest of our bathroom. This section of the bathroom included closable doors that swung open 180 degrees, allowing privacy when closed, yet helping to make the room feel more open when they were open. 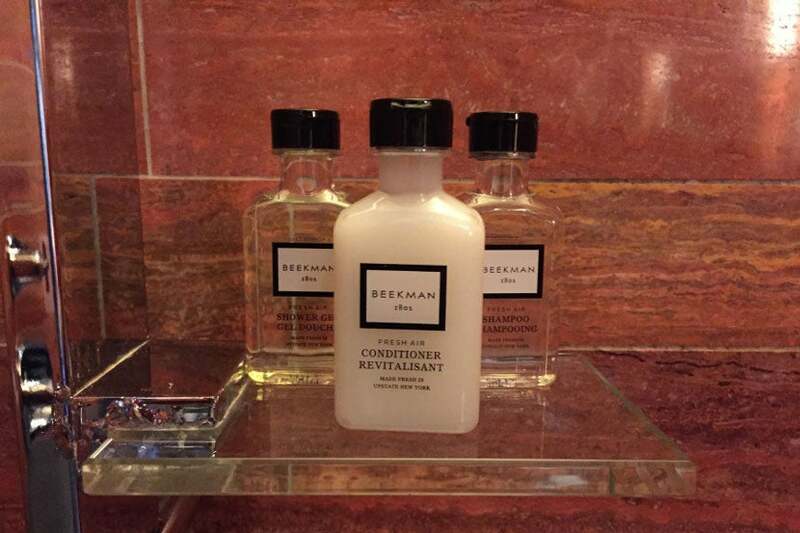 The bath products were Beekman-branded and quite nice. The Beekman bath products were great. 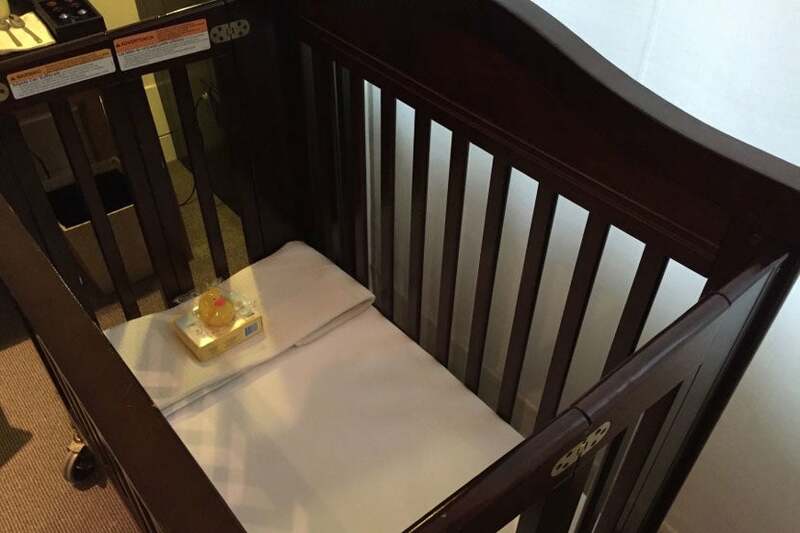 The final part of the rectangular-shaped room was the bedroom, which was also simply furnished. The King-sized bed was pushed against the northern wall. Our cozy bed at the Andaz 5th Avenue. 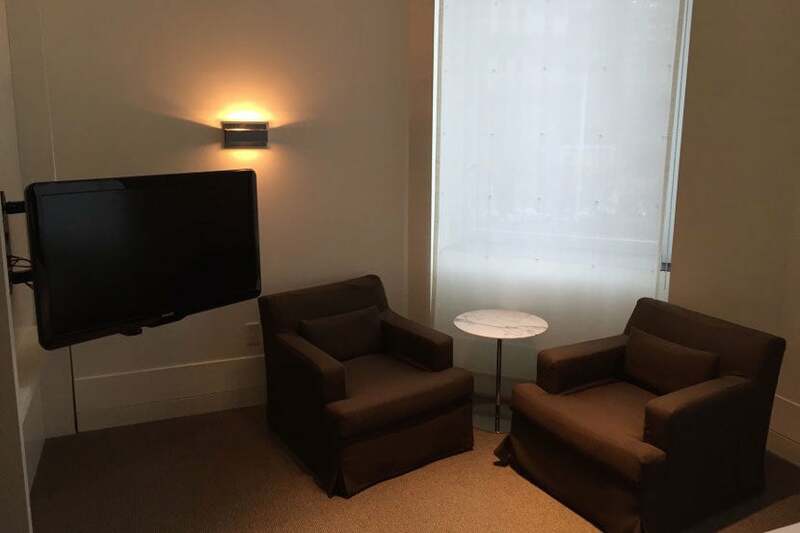 There was also a small sitting area with two very comfortable chairs and a television that swung out from the wall. Perhaps my favorite aspect of the bedroom was the view. Since the Andaz Splash Suites are billed as corner rooms, they include windows that overlook 41st Street (not much to see) as well as some that overlook 5th Avenue. 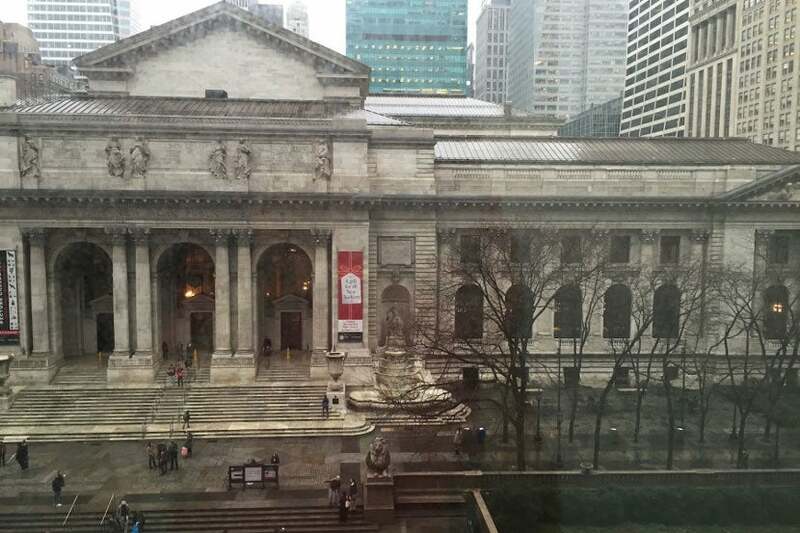 As a result, our room gave us a terrific view of the New York Public Library. The view from our room, looking across the street to the New York Public Library. Despite the simple decor, I found the room to be incredibly warm and comfortable. The low-sitting couch was fantastic for lounging and the modular coffee table provided plenty of flexibility for our room service trays. While the narrowness of the room could’ve been claustrophobic, the floor plan was efficient and I felt that the furnishings filled the room without being too overwhelming. 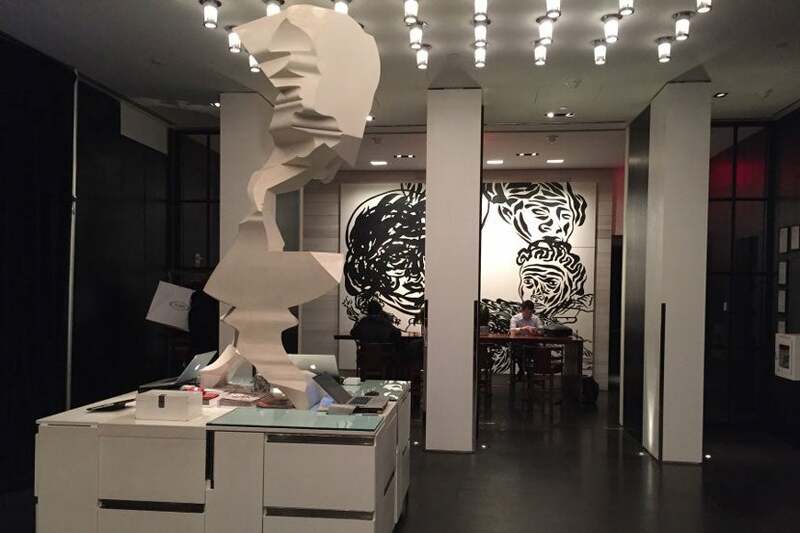 The Andaz 5th Avenue is home to two on-site dining options: The Shop and The Bar Downstairs. The former of the two serves breakfast, lunch and dinner on weekdays plus weekend brunch, and it’s where the complimentary Diamond breakfast is served. 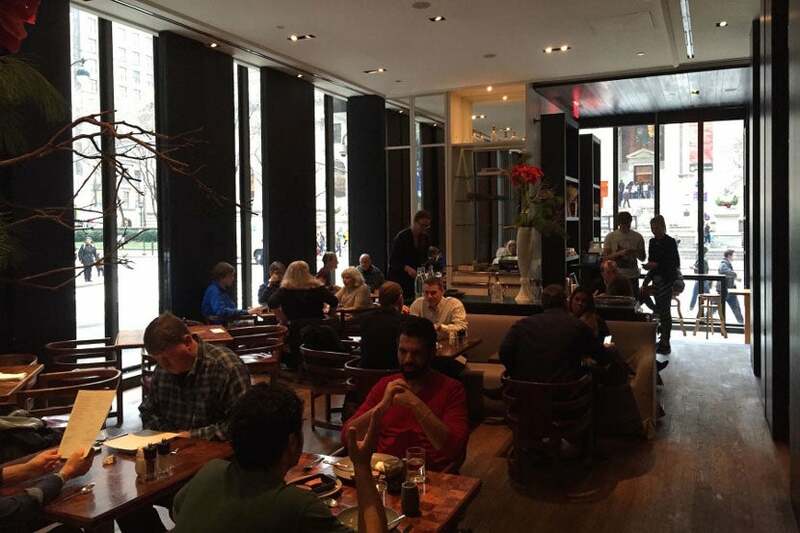 The Shop, one of two places to dine at the Andaz 5th Avenue. Quite possibly my favorite aspect of being a Diamond Gold Passport member is the ability to have room service breakfast at many properties. The official policy was a $75 credit per night and the terrific menu made spending that amount very easy. 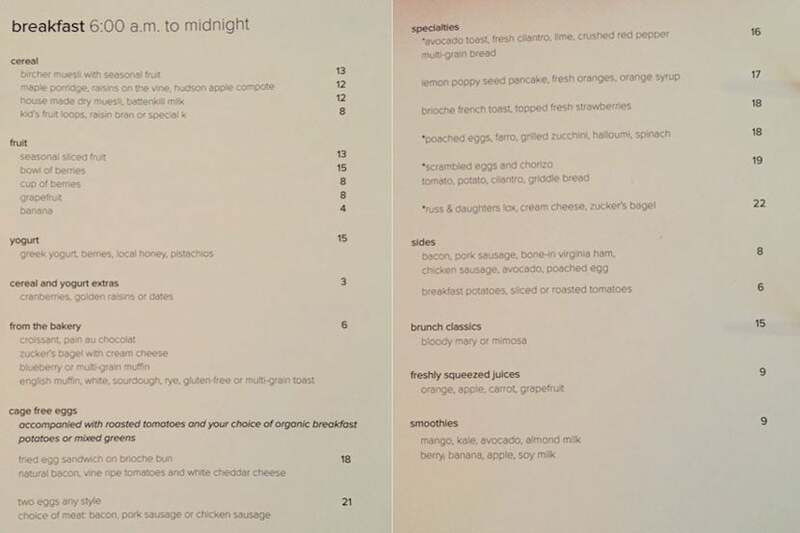 A peek at our Diamond Gold Passport room service breakfast menu. Like the other Andaz properties I’ve visited before, this location also offered a complimentary wine hour every evening in the communal area of the lobby. Another look at the lobby, where a nightly complimentary wine hour took place. This is also where you could grab a cup of coffee or tea, though given the balmy weather we experienced during our trip, we were content with the cold (and complimentary) non-alcoholic drinks from our mini bar! The hotel also boasted an extensive fitness center in the basement as well as the option to arrange a spa treatment in your room, however, given the small size of the property, there’s no spa on-site. We have now stayed at four Andaz properties — the two in New York plus the locations in Amsterdam and Savannah — and so far the brand is four for four. While our terrific room upgrade helped make this short visit a memorable stay, Andaz 5th Avenue is also perfectly situated to explore the touristy sites of the city. 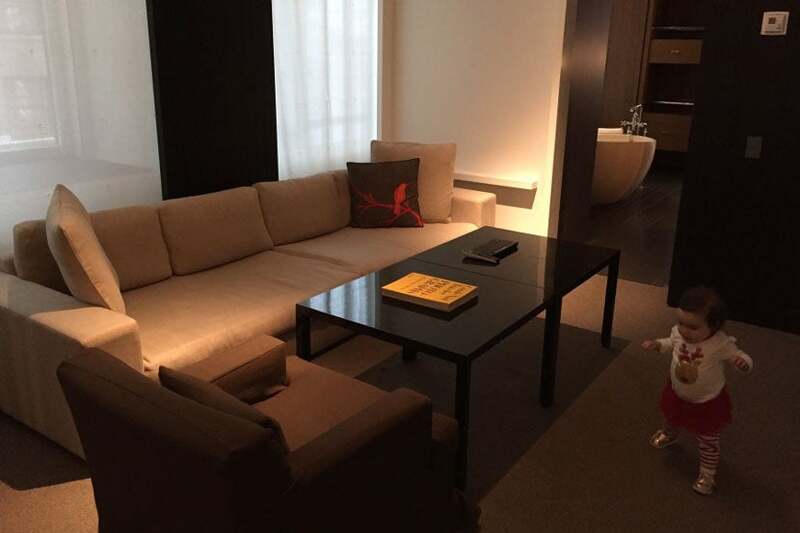 Its boutique feel and all the terrific amenities make this property a fantastic option when visiting the Big Apple — I’m just sad we weren’t able to stay longer! Have you stayed at the Andaz 5th Avenue? Share your experiences in the comments below! Featured image courtesy of the Andaz 5th Avenue.